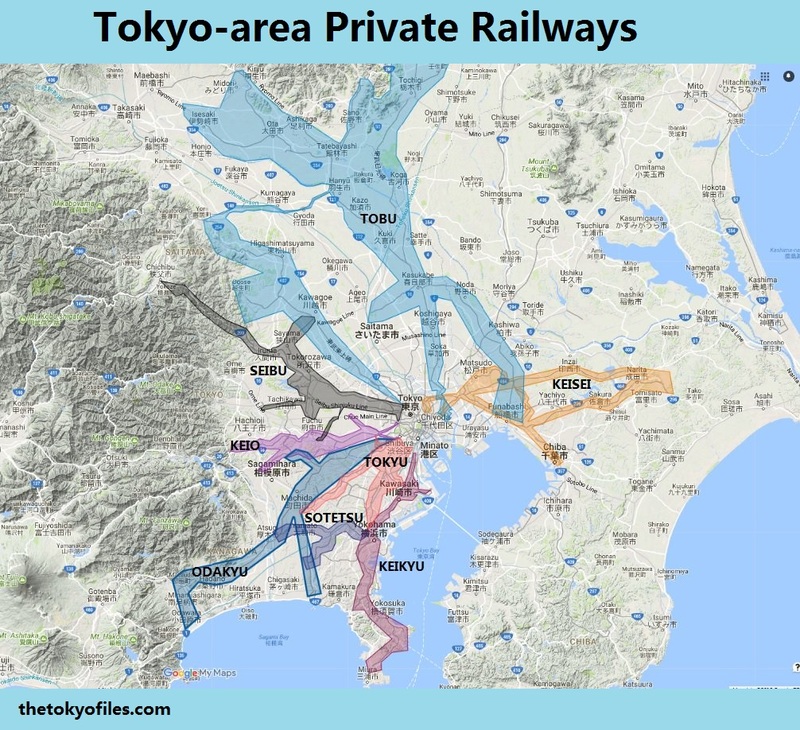 In a previous post I described how Tokyo is built on top of a system of former rivers, canals, and streams. 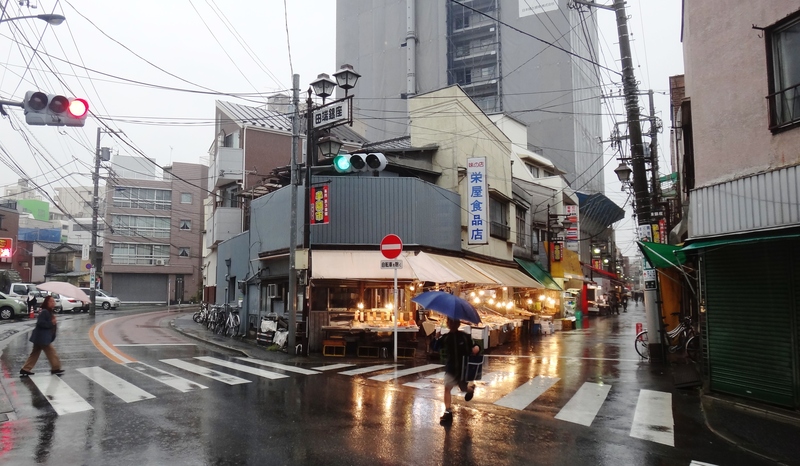 These waterways largely disappeared after World War II, but prior to that time, central Tokyo was dominated by moats and canals that had been shaped during the Edo era. 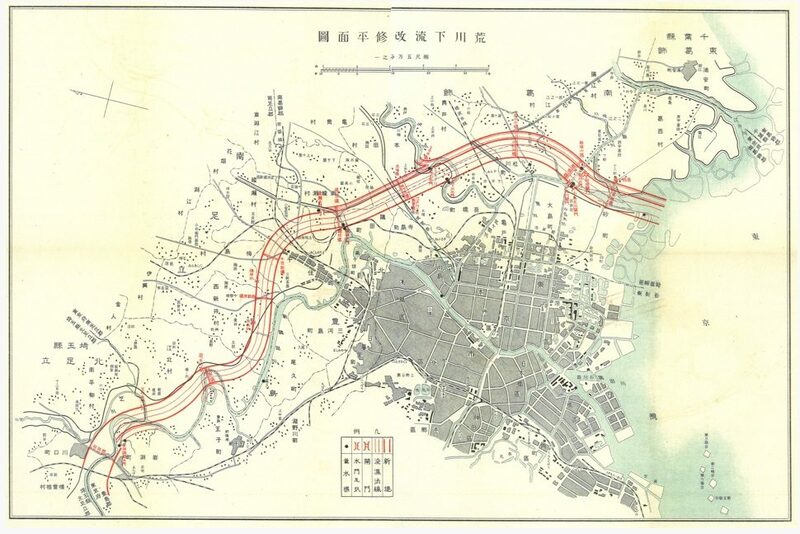 These waterways are visible in a map of Edo-era Tokyo, and an aerial photo of the same land area from 1945. The yellow box indicates the approximate area described in this post. 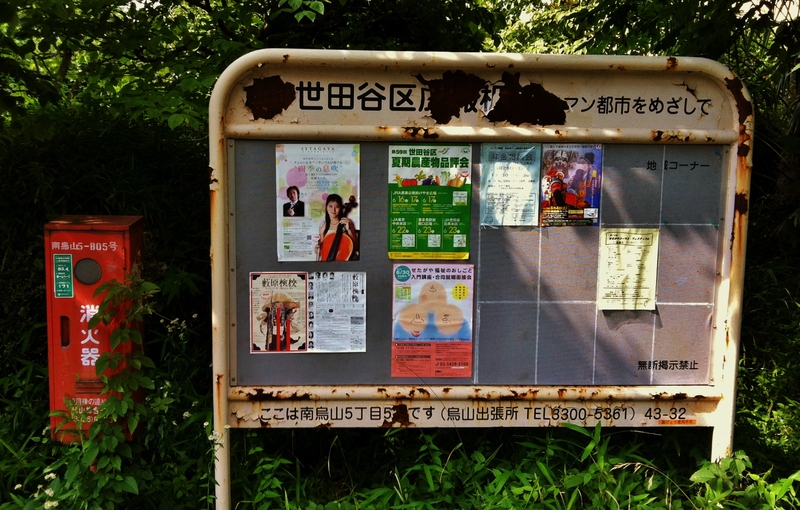 We start at what I consider the spiritual center of Tokyo. In the first picture, circa 1940, we face east, facing the entrance of Tokyo Station. The Edo Castle Outer Moat 江戸城 外濠 runs parallel the tracks, east of Tokyo Station. In the second picture, from 1945 (source), we face north; damage from the WW2 firebombing is quite evident on the right side of the photo. For reference, the old Tokyo Central Post Office (now the KITTE mall and JP Tower JPタワー) is the trapezoidal building at the southwest corner of Tokyo Station. Moving south from Tokyo Station is the visually interesting and culturally rich area around Sukiyabashi bridge 数寄屋橋, near Yurakucho Station. The Edo Castle Outer Moat continued its path through this neighborhood until after WW2. These comparative photos are from circa 1945, and circa 1961-1969, when the canal had been filled-in. 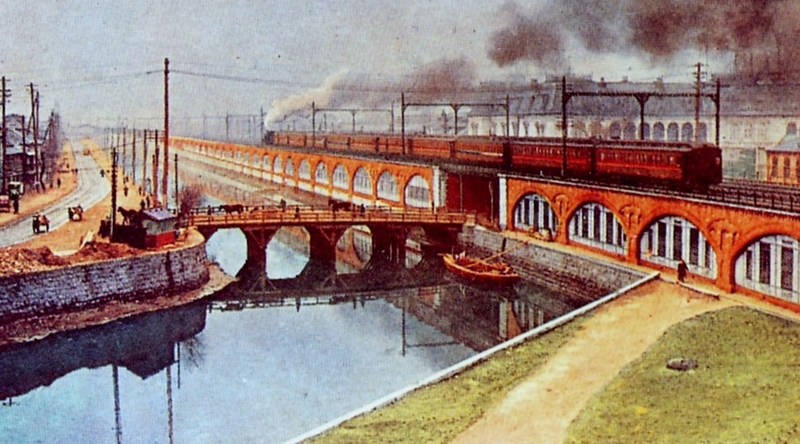 The following photograph from 1948 shows several bridges that span the canal (source). Sukiyabashi is mostly offscreen to the left; the Sukiyabashi koban 数寄屋橋交番 is the small building behind the uniquitous Toden streetcars of that era. The other bridges, from front to back, are Marunouchi Bridge 丸之内橋, New Yuraku Bridge 新有楽橋, and Yuraku Bridge 有楽橋. In the first photo, from 1932, we look north towards Sukiyabashi and the Asahi Shimbun Headquarters, the large building behind the bridge. The second photo is a close-up of the newspaper’s headquarters, probably shot around the time the building was completed (~1927). The Nichigeki is one of the most identifiable ‘lost’ buildings of Tokyo, owing to its distinctive rounded front and its location next to the Shinkansen tracks. Some nice photos of the theater are included below, including the Shinkansen and the theater (after the canals had been filled); a child running in 1951 (“Michiko shopping at Ginza District”, by Werner Bischof); and a close-up of the canal, Sukiyabashi, and the theater that appears to be from the early post-war period. The Edo Castle Outer Moat continued south towards Hibiya Park and the Imperial Hotel. In these comparisons from 1945 and 1961/1969, the buildings remain unchanged, but the loss of the moat is obvious. For reference I’m including another aerial photo, from 1953, of Sukiyabashi, which includes a building not seen in the earlier photos: the old Hibiya Theater 旧日比谷映画劇場 (1934-1984), which appears at the bottom-left of the photo. (Taimei Elementary is at bottom-right). 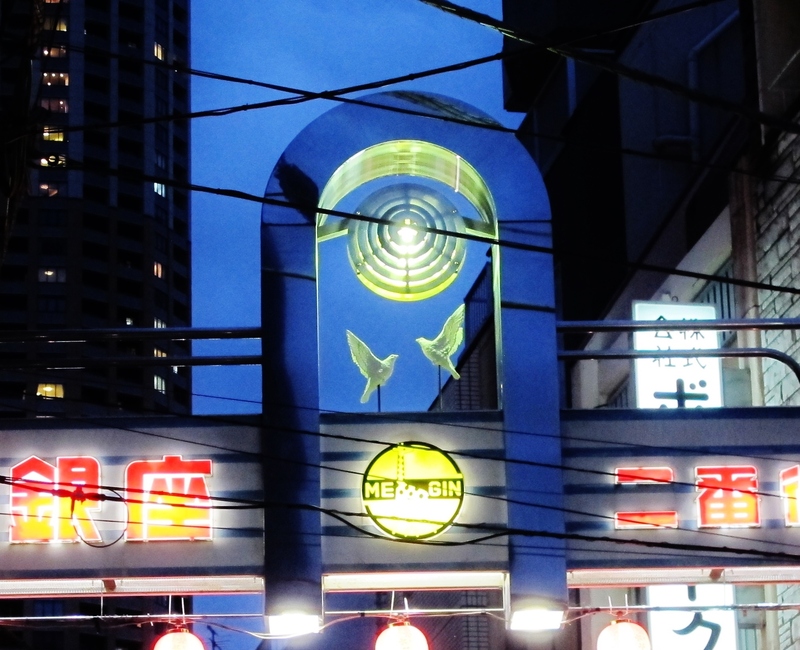 The Hibiya Theater had a distinctive domed roof, as seen in the first photo. The theater, along with the neighboring Ernie Pyle Theater, are seen together in a photo from circa 1949-1951, which shows a section of the old canal. The Ernie Pyle Theater, seen in a close-up below, was the once-and-future home of the Takarazuka Theater, but was re-purposed for entertaining Allied forces during the Occupation. Recently, Taimei Elementary was the subject of unwanted attention due to news that its school uniforms were designed by Armani and cost ¥80,000 ($730). It was subject to a different magnitude of unwanted attention when it suffered fire damage from WW2 Allied bombing. Below, right, is the canal and the school, around the time it was built in 1929. Today a narrow path runs between the school and the building/highway that was built on top of the canal. The second photo shows the school today, from the non-canal side (map). In the third photo, facing south, the school is partially obscured at the left, but the arched windows are clearly visible. Close to all of these buildings was Frank Lloyd Wright’s old Imperial Hotel 帝国ホテル, which is seen in a postcard from 1940. Across the street from the hotel is Hibiya Park and Hibiya Hall. The second photo, taken from a train and facing north-west, shows the Imperial Hotel and the Ernie Pyle theater. Ginza Crossing is the retail heart of Tokyo’s shopping district and the intersection of two Toden streetcar lines. Sitting at the northwest corner is Wako Department store and its clock tower 和光の時計塔 is its mascot. The building, built in 1932, survived the WW2 firebombing, and is an unofficial mascot of Ginza. Seen below is an aerial photo of the store from the 1940’s (source), with the Sanjikken-hori River 三十間堀川 to the east. The second photo is the Miharabashi Bridge 三原橋, which spanned the Sanjikken-hori River; in this photo from 1951, the river appears to have been partially filled-in, and the Wako Clock Tower is in the distance (source). And here are two aerial photos of the area from circa 1945 and circa 1961-1969. Shimbashi Station 新橋駅 and the Shinbashi neighborhood are named after a bridge of the same name that used to cross the Shiodome River 汐留川. This photo from the 1960 shows just how many bridges crossed this river in the past. In the second photo we see an ornamental post from the original bridge that remains on the site today (新橋跡の親柱 / 新橋の親柱). Old bridges of the Shimbashi neighborhood of Tokyo. The best part about researching this section of town was learning that a water bus 水上バス used to serve the Shiodome River. The first photo, from 1959, shows the water bus landing site next to the old Shinbashi bridge, and the second photo provides a wider perspective (a yellow square was added for reference). The third photo shows the water bus in what I believe is also Shinbashi. For nightclub aficionados, notice Ginza Club Harem 社交喫茶「ハレム」, near the boat landing, a close-up of which is seen the fourth photo. Kabuki is an iconic Japanese art form, and the Kabuki-za theater 歌舞伎座 is the home of Tokyo’s kabuki scene. The theater has undergone several iterations on the same location; in the following photo from 1933 we see the Kabuki-za theater and the former Tsukiji River 築地川 (photo published in 「大東京寫眞案内」 “Great Tokyo Tour Guide”). The river is more obvious in a color postcard from the 1940’s. By 1963 the canal had been filled, replaced with a highway and a handful of parks; the Tsukiji River Ginza park 築地川銀座公園 is seen in the following photo from the film Sing, Young People! 歌え若人達; the Kabuki-za theater is at the far-right of the photo. Here are a few photos: (1) Miyoshibashi in a color postcard; (2) the former Kyobashi Ward Office 京橋区役所, as seen around 1930. (3) the Miyoshi Bridge Monument 三吉橋の碑; and (4) the Star Hotel, which sat across from the Kyobashi Ward Office. Let’s finish this off with a a pre-1933 a view of Tsukiji Market, which has the same curved shape today. The wide Sumida River is at the right. A canal, either part of the Tsukiji River or the 南支川 is in the center of the photo and elbows to the left at St. Luke’s Hospital. This is an early photograph due to the fact that the iconic Kachidoki Bridge has not yet been built (it was built between 1933-1940). The second photo is a much closer view of the area covered by the first. It is probably taken after the war due to the automobiles; Tsukiji Hongan-ji temple is at left, and the tower of St. Luke’s hospital can be seen in the distance at right. The final photo focuses on St. Luke’s, and was probably taken after 1933, when the hospital was rebuilt following the 1923 Great Kanto Earthquake. The amount of information is incredible. But i have so many questions. Obviously they needed more space but was it worth to fill the rivers. Weren’t they scared of overflowing water during typhoons? Landslides due to improper landfilling which is very common nowadays. Then again,I assume many rivers, especially smaller ones were very dirty because of people throwing stuff in it, like in Osaka. We have some water ways but the water level is extremely low, greens growing and lots of trash. Anyway very interesting stuff.